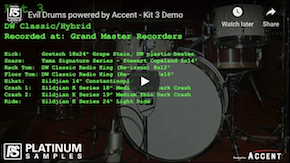 Platinum Samples have released Joe Barresi’s Evil Drums powered by Accent. Joe Barresi is one of the busiest producer/engineers working today with an impressive list of credits including albums by Tool, Queens Of The Stone Age, Weezer, Clutch, Pennywise, Turbonegro, Bad Religion, and many more. Featuring 6 full drum kits, 6 kick drums and 6 snares (a total of 64 drums and cymbals) the Evil Drums Library sets the standard by which other drum libraries are judged. Recorded to analog tape at Sound City Studios (featured in the Dave Grohl documentary 'Sound City') and Grand Master Recorders using their vintage Neve consoles, compression and EQ, Joe Barresi has captured a diverse ensemble of drum sounds suitable for any genre. 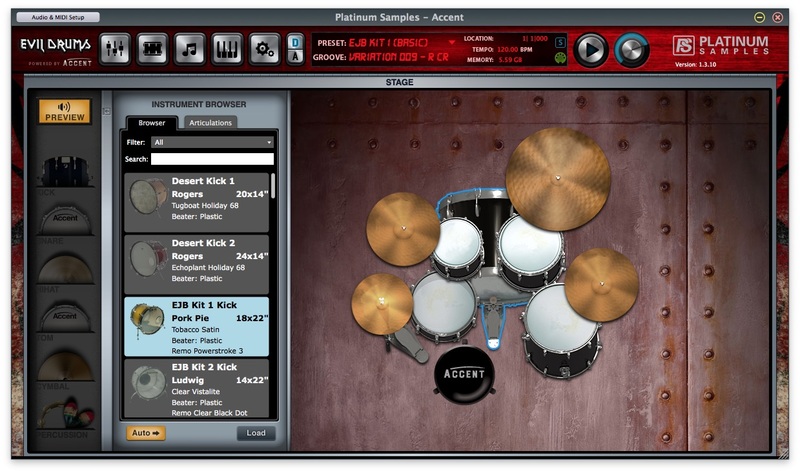 Evil Drums powered by Accent includes Platinum Samples’ Accent virtual drum instrument. Accent comes with a Standalone version as well as AAX64, VST2, VST3 and Audio Units plug-ins for use in a host DAW. Accent also includes it’s own internal effects (Gain, Filter, 4 Band EQ, Compressor, Limiter, Gate and Reverb) as well as has support for 3rd party plugins (VST2, VST3 (on macOS and Windows) as well as AU on macOS) directly inside the Accent Mixer. With a resizable user interface and a familiar DAW style Mixer users should find it extremely intuitive to use. 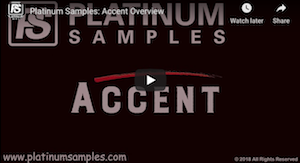 Also included are the Platinum Samples Grooves Volume 1 formatted for Accent with over 2,000 groove variations. Please visit the Evil Drums web page for additional information, videos and demos. Last edited by Platinum Samples; 01-15-2019 at 11:01 PM.